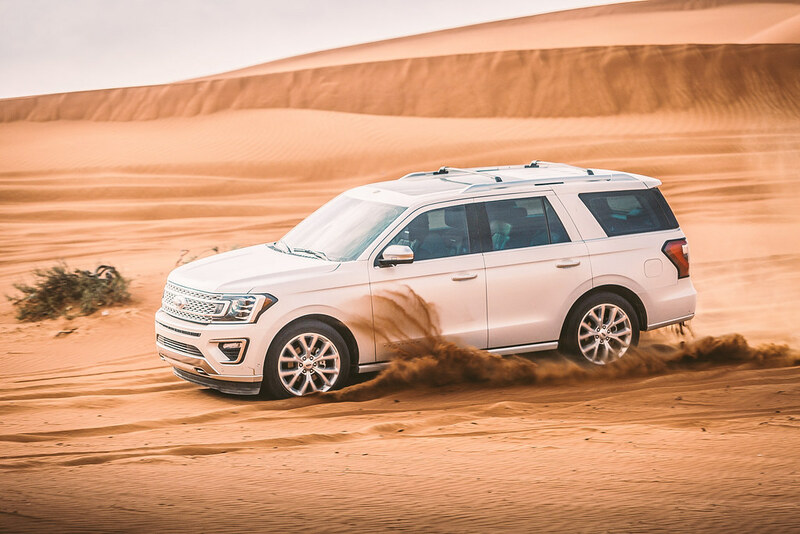 Finally we get to experience the all new Ford Expedition in person, thanks mainly to the excellent team at Ford Middle East who organized a trip that included road, sand and rocky terrain on our route from Dubai to RAK’s famous Waldorf Astoria. 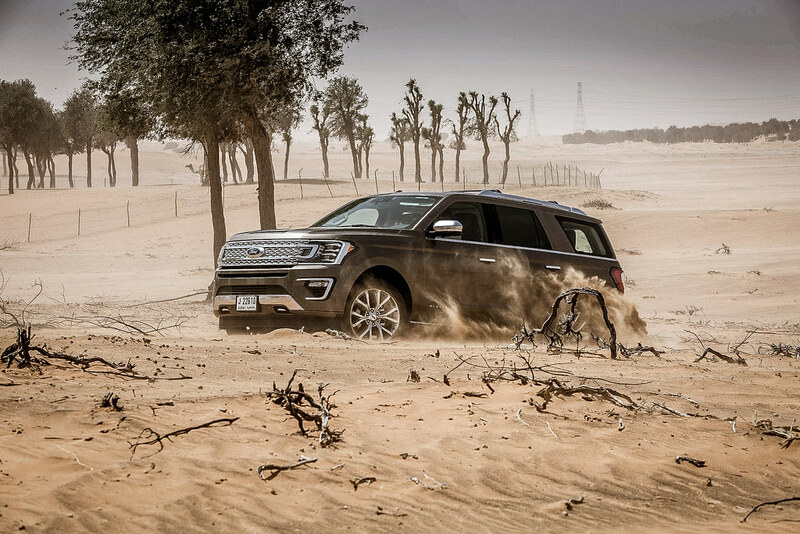 The family vehicle which had been re-defined by the likes of the Chevrolet Tahoe and GMC Yukon Denali now has a game changer, and it’s this fantastically capable and comfortable Expedition. Let’s face it, why repair or change something that’s working right? 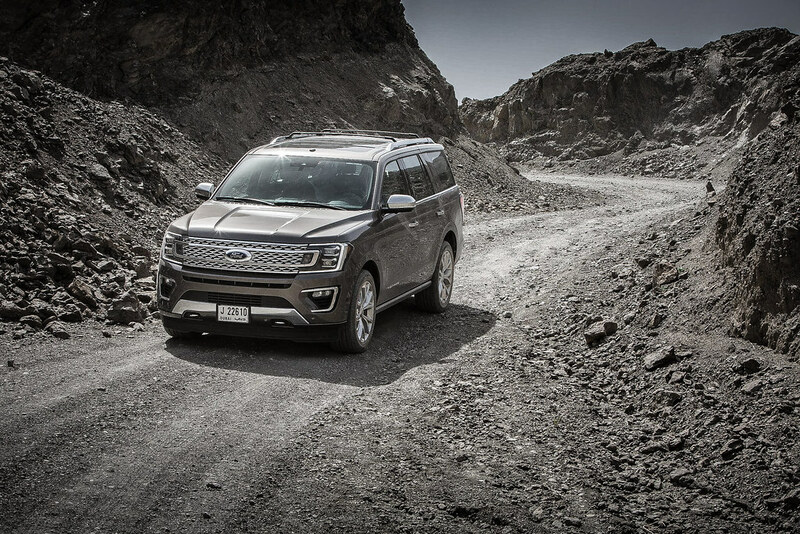 That’s exactly what happened to the previous generation of the Expedition whose production ran for a decade (2007 – 2017). 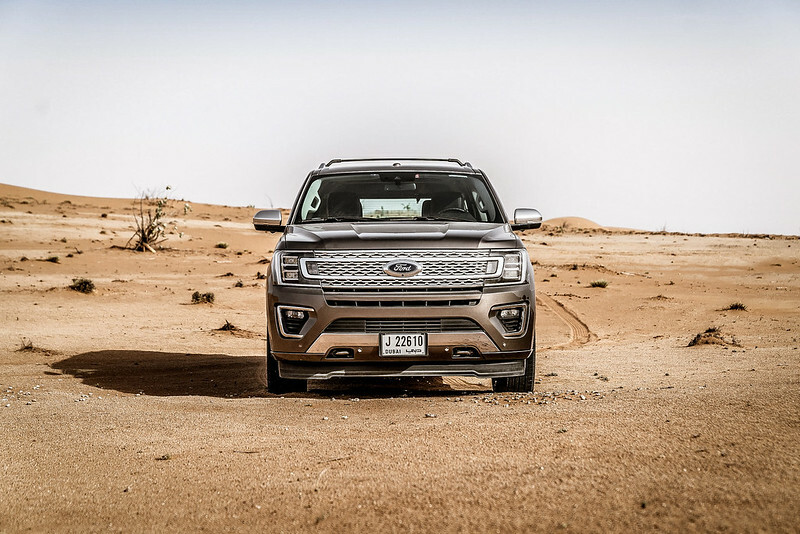 And so when Chevrolet’s Tahoe and GMC Yukon Denali started eating away at the Expedition’s humble pie, the people at Ford decided to finally call in their technical team and build an all new Expedition and at the same time why not dip their hands at the parts bin of the Raptor as well!! 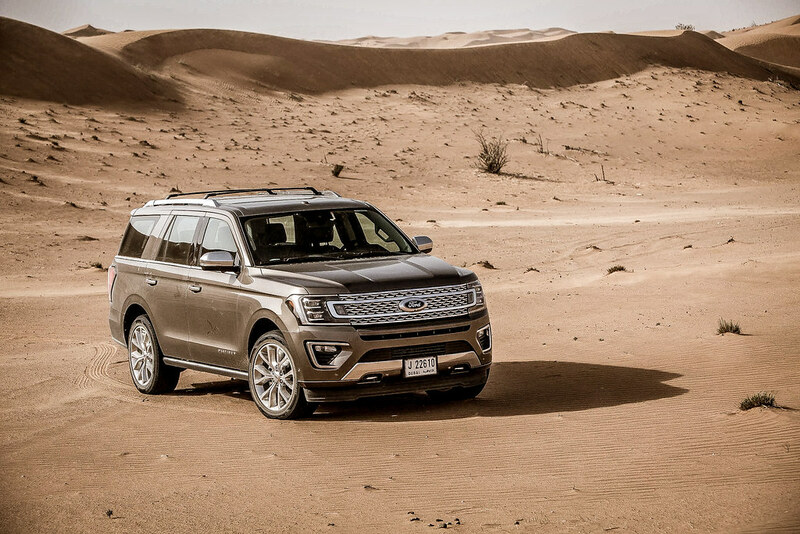 The Expedition is a full-size body-on-frame SUV based on Ford’s best selling F150 architecture. 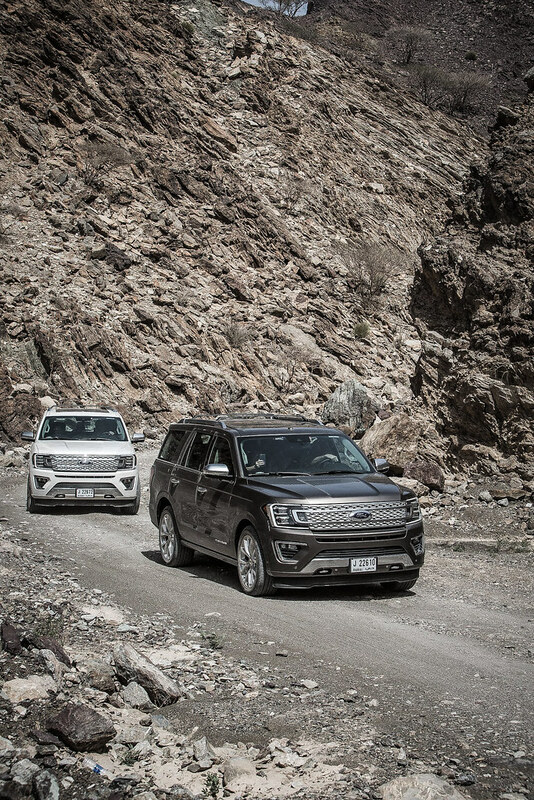 For now, the all-new Expedition would be available in 3 trims (SL-SLT-Platinum). The engine remains the same but produces 375Hp from the 3.5L EcoBoost twin-turbo V6 for the SL & SLT trim lines, the Platinum on the other hand gets a retune and it’s good for 400Hp. 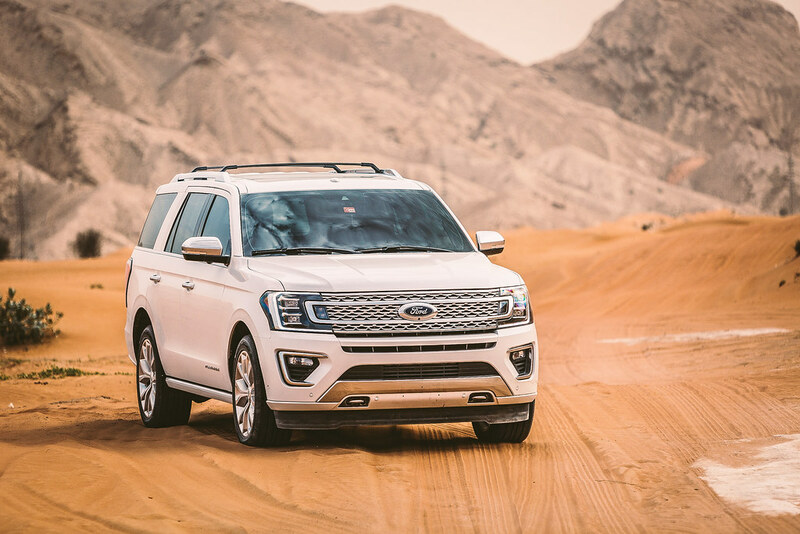 That’s an improvement over the previous generations’ Expedition which was powered by an EcoBoost V6 but made 365 hp and 570 Nm of torque, an increase of 35Hp and 80 Nm of torque for the new Expedition Platinum. 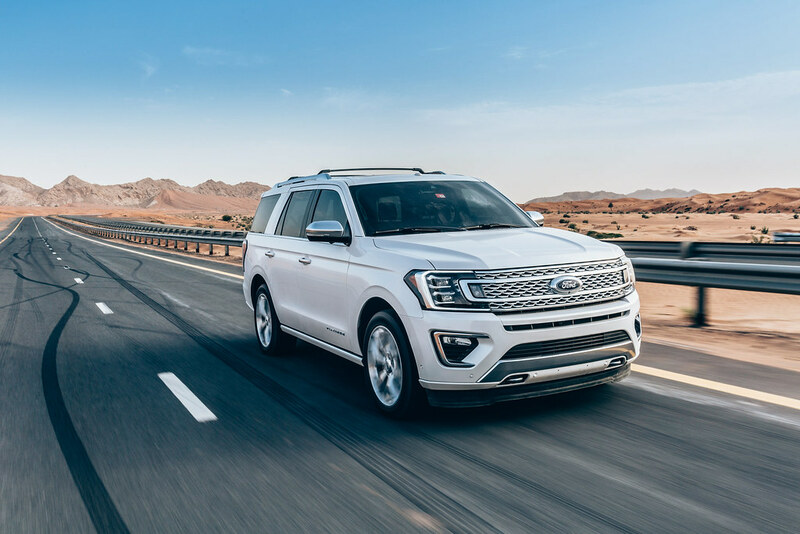 Ford along with GM decided to co-share the development of the new 10-speed automatic transmission and this drives the new Expedition. The short ratios made quick work of the 0-100 kmph sprint, which can be done in 6.8 seconds. 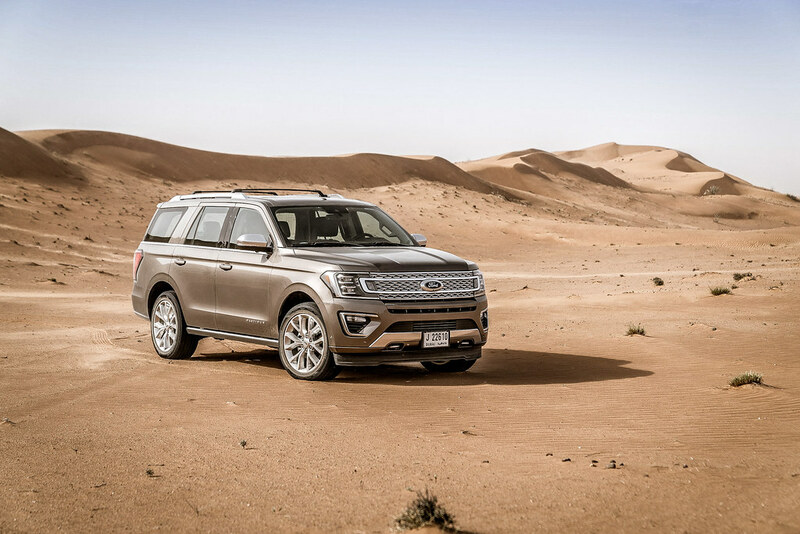 Did we hear that right, well Ford claims that, and we can also verify from our drive that the Expedition has the oomph to 100kmph and its rather quick. That’s quite a tall order since the Expedition tips the scale at over 4 Tonnes. 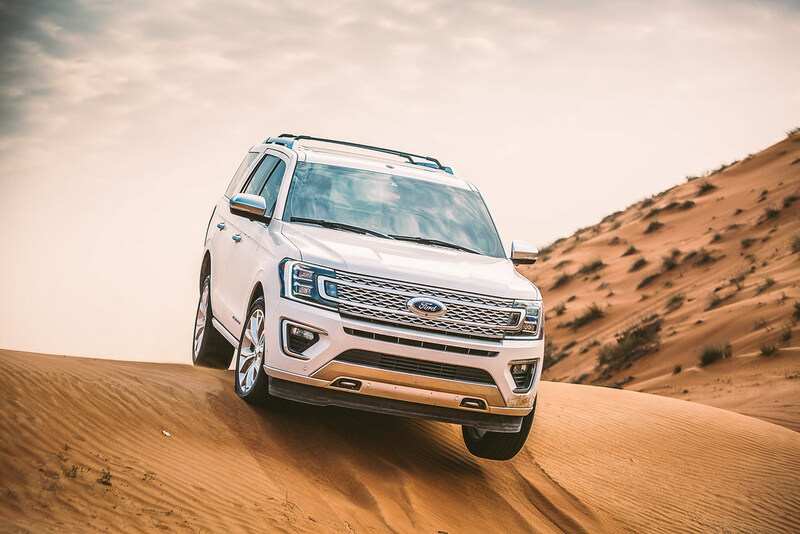 The EcoBoost for the Platinum delivers 650 Nm of torque at 3,500 rpm and with the aid of its new 10 speed; the Expedition does have the nimbleness that defies its size. The new Ford Expedition comes with many new trick bits. First of all it’s the class exclusive 10 speed automatic transmission that is strong enough for off-road yet silky smooth in its gear shift for the urban road cruiser. Wireless charging without any add on sleeves for cell phones that support wireless charging is a great feature, and one we feel that every large SUV should always have now a days. 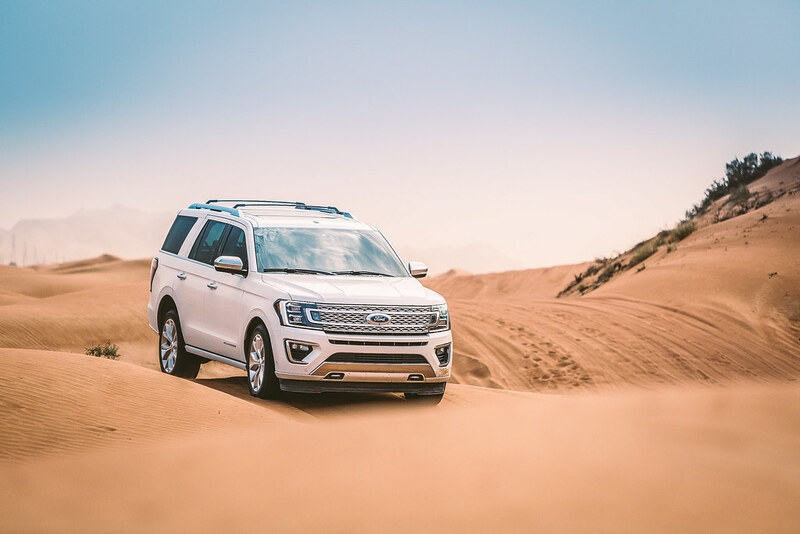 Ford’s third generation infotainment systems user interface (UI); SYNC 3, now comes with Apple CarPlay™ and Android Auto™ and furthermore with the new Expedition it debuts an off-road map for the Middle East. There are 7 modes of driving styles in the new Terrain Management System and adapts the engine characteristics and chassis dynamics for on and off-road driving conditions. 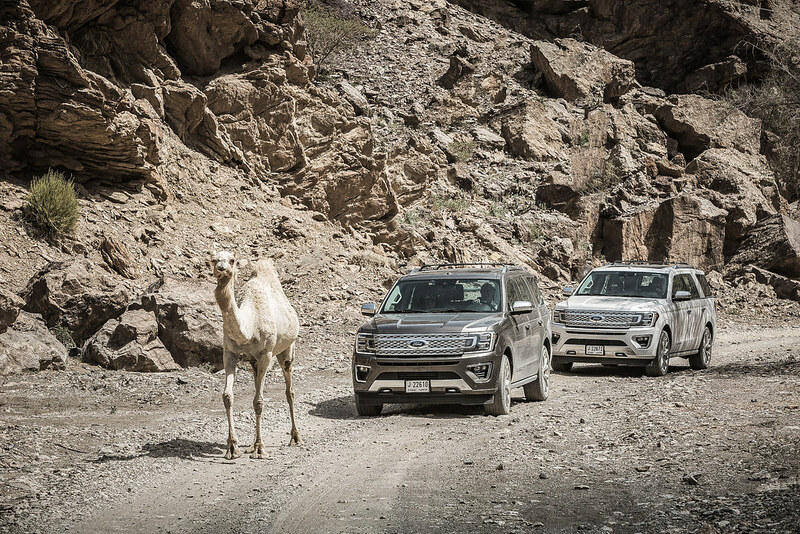 Our drive, which included a pleasant detour from Dubai to Ras Al Khaimah, included highway, sand and gravel terrain. While we did not take the Expedition to an all out desert dune bashing but we did travel off the beaten path with 5 people on board on each of the Expeditions in comfort with a capital “C”. 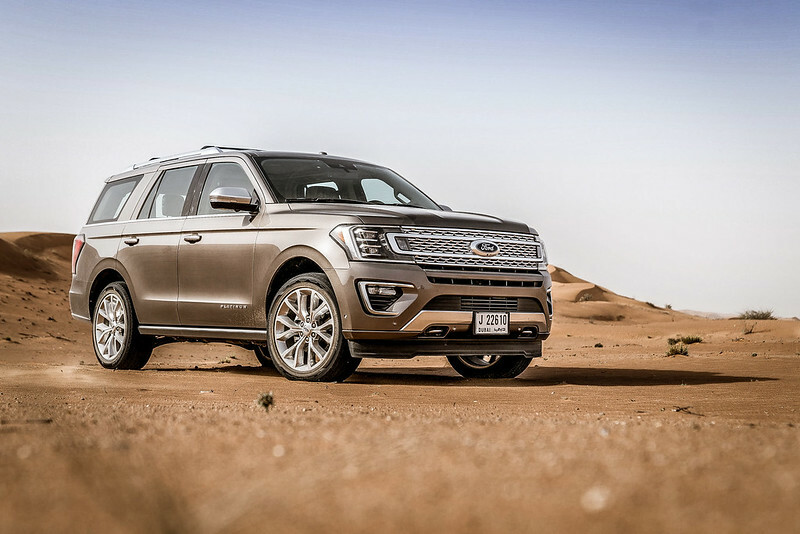 The XLT felt slightly sprung tight on road, probably to control its sheer weight and is comparable to that of the Yukon Denali and the Tahoe and even the Escalade. But, the Platinum trim’s ride quality is like that of the Range Rover Vogue, and no, it does not come with an air suspension. 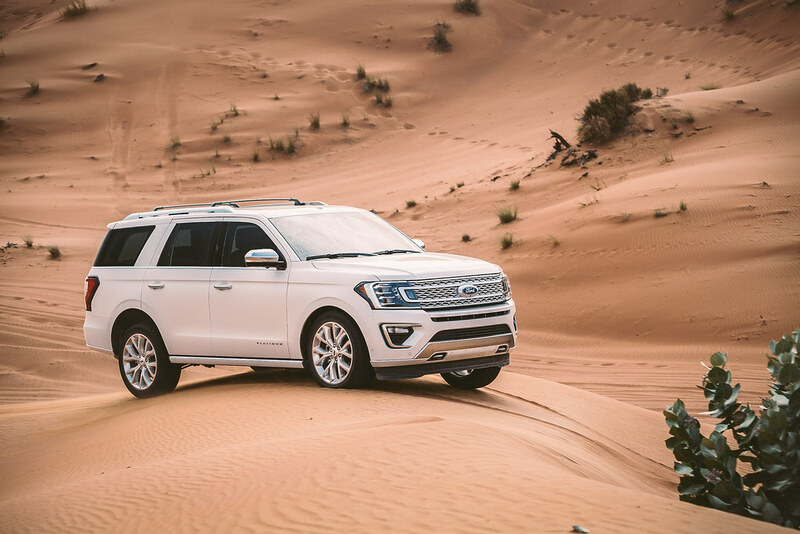 What Ford did with the Expedition Platinum trim was equip its suspension with Continuously Controlled Damping (CCD) system. 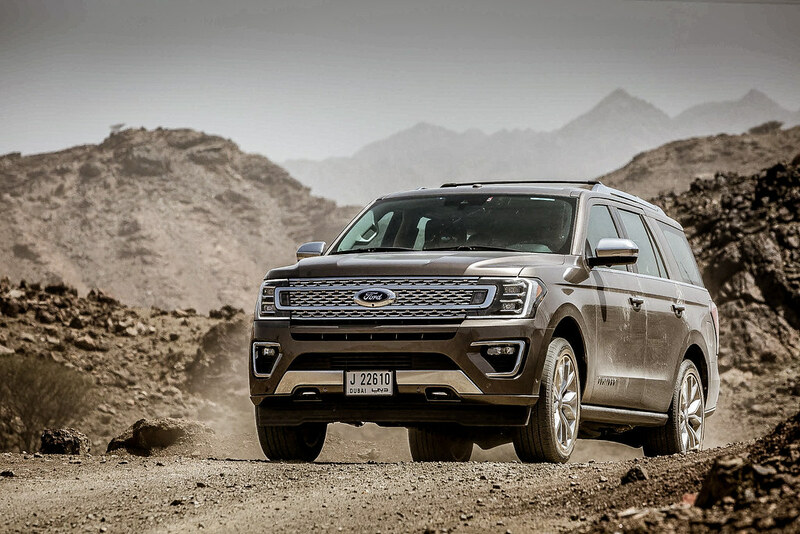 Essentially it’s Ford’s revolutionary computer-controlled shock absorber system that significantly reduces the jarring feeling of driving on un-even road and works, in our opinion, much better than Cadillac Escalade’s and GMC Yukon Denali’s Magnetic shock system. 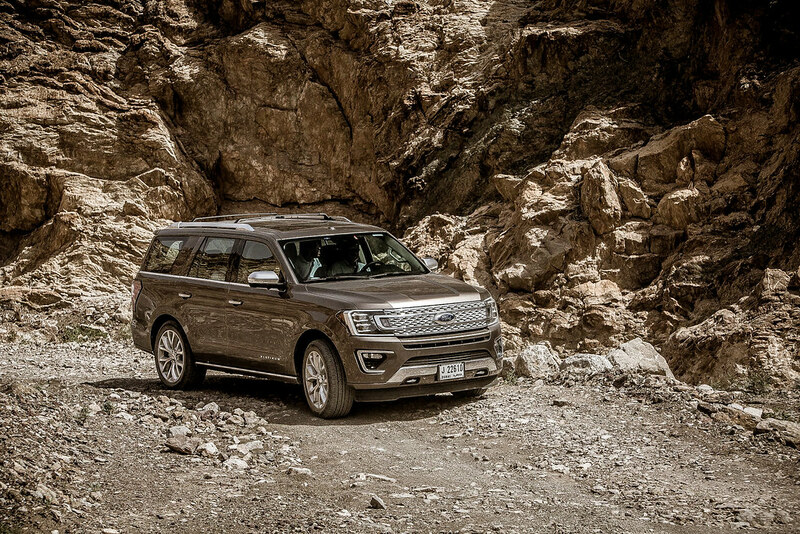 The Expedition could be ordered in 7 and/or 8 passenger seating variations. The Platinum of-course gets softer feel leather and an electric running board for easy entry and exit out of the vehicle and massive 22 inch rims. Our long haul, which included a lot of stops for driver change and photo opportunities, were done with the engines turned on, and we averaged 17.8L/100kms. It’s higher than what we expected it to be and would have to wait for a more realistic figure once we get it for a proper review. 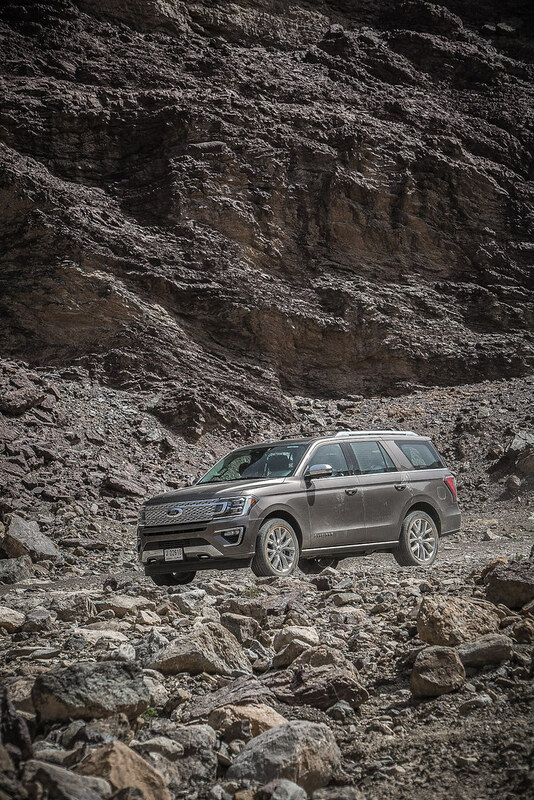 But as far as our first drive goes, there is no doubt that the Expedition has regained its mantle as the King of family mover. Suspension – Front Independent double wishbone short- and long-arm (SLA); stabilizer bars with low-friction bushings; dual-path upper mount shock absorbers. Suspension -Rear Second generation independent multilink rear suspension (five-link design); mono-tube shock absorbers, stabilizer bars with low-friction bushings and ball-joints.